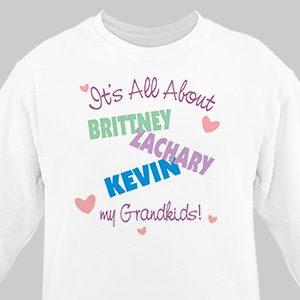 Show everyone what life is all about with our Mommy Personalized Sweatshirts. This Personalized Mother’s Day Gift for Mom or Grandma makes the perfect unique gift your Mother or Grandmother will cherish forever. Love the variety & price of your products! My only suggestion would be ... if you offer a design in more than white than picture it in different colors. I was torn between a white or gray sweatshirt, it was only pictured in white. I wasn't sure that the design would show as well on gray.